Fits in Saddlebag or Tour-pac! Saddlebag chair...take it with you! CH-P: The world's best motorcycle chair. Ultralight, durable and compact; so take it with you on tour. Every chair goes through several levels of factory quality control before it is shipped out and the product is designed to last for years. That being said, we understand that things happen, so it has a lifetime OEM guarantee. It's more than just a motorcycle chair. CH-K: A lightweight chair with the comfort and beauty not found in other portable chairs. It packs in a bag to a length of 22" and 4" x 6" in diameter. The CH-K is made from hardwoods and aluminum, and all hardware is stainless steel. All wood is double dipped in marine grade polyurethane. The finish is thicker than a spray and protects the Chair for a lifetime. The cloth is 1000 denier nylon and is cut with heat to prevent raveling. 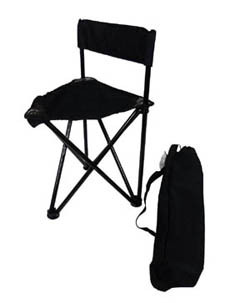 The Chair comes with a bag and carrying strap. 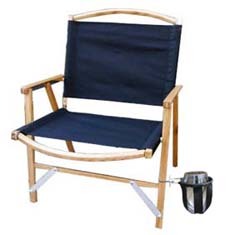 The CH-K is the touring chair of choice for Harley motorcycle campers! CH-KW: Just like the Original Kermit Chair, but 2" wider for a total of 21" from arm to arm. 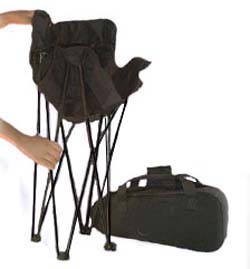 CH-2: This three leg tri-pod design is great for mounting to your tour-pak luggage rack. 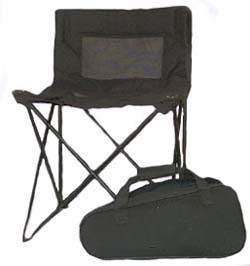 The chair folds up to a very small size so that when you put it in the carry bag the dimensions are only 29" x 4" x 4" and weighs only 5 pounds so it's very easy to carry tour with. 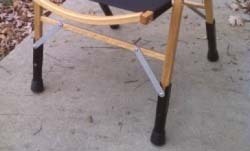 The chair is also built very well and can support up to 275lbs with no problems. Very light weight design makes this chair perfect for motorcycling. When unfolded back seat rest height is 20". CH-1: The Electra Glide CH-1's are the ultimate for use with H-D touring motorcycles. Remove from the case and use in a minute, as the chair expands into a full size quad chair. 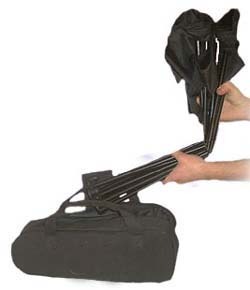 When heading home, it folds down into the compact case to put in your saddlebag or strap onto your bike. After long hours on your bike, the last thing that you want to do is sit on the ground. This is a design that is simple, light and tough as possible. 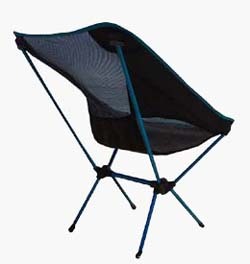 It offers a unique breathable partial mesh seat and backrest. 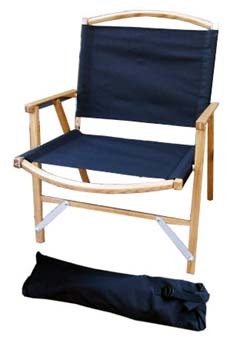 This high quality double layered 600 denier polyester chair is designed to fold into a compact, water resistant and zippered carrying case. The powder-coated steel is thick and of higher grade. The case has an extra heavy-duty zipper and Velcro handle strap for ease in carrying to your next rally or hill climb. When folded into the case; only 17" long, 8" tall and 4" wide. Weight in under 8 lbs.